Do you regularly require new content, such as for a blog? 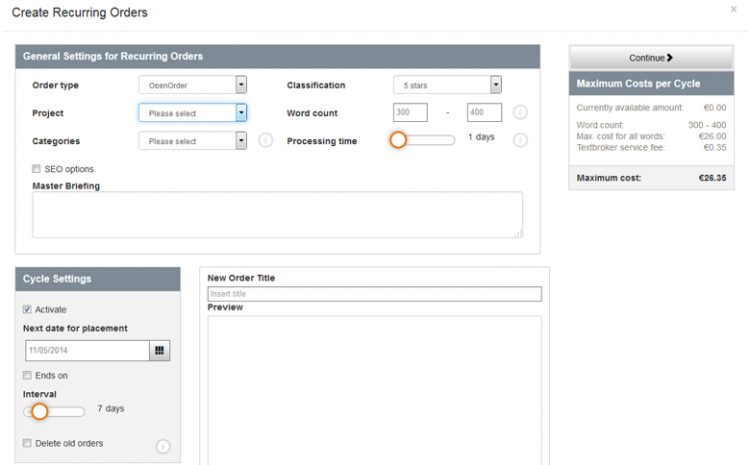 With the recurring order function, Textbroker offers you the opportunity to set up automated order placement. This function exists for all order types, no matter if you prefer placing orders through OpenOrder, DirectOrder or TeamOrder, thus setting up a recurring order for your projects without any hassle. The orders will be automatically placed at the intervals that you define, given that the necessary funds are available in your account. To ensure that this is always the case, Textbroker gives you the option to set up a warning message for when your account reaches a minimum balance. Under “Assignments,” you can get an overview of your recurring orders by clicking on the relevant link. This is where you can set up your recurring orders and state how frequently these should be placed. You have a number of choices regarding the type of order that can be selected. You can place OpenOrders, which are available to hundreds of authors, or if you prefer to have them written by a chosen team, then you can set up a new team for this project. If you wish to have your orders worked on by just one author, however, then add the chosen author to your address book and then select them for a DirectOrder. Once a type of order has been chosen, define the general settings of your recurring order, such as project and category, word count, quality level of the authors, as well as the processing time and any SEO options that are required. With the latter, you can determine the keywords and their quantity. Under “Briefing,” compose a general order description. Your keywords and order description are applicable to all of your articles in this recurring order. The last step is to establish the interval at which the orders are to be placed. Select the date of the next placement and also the date of the very last one in this series. The maximum costs per interval are then automatically displayed. Once you have received a text, proofread it as always and then publish it! We look forward to hearing your feedback on our recurring order system; send us an email to clients@textbroker.com.